Summary: An OFX study found that 58% of small businesses had international customers. Canada provides small business customers with an opportunity to grow their businesses internationally. How your bank can help. All community banks want to grow, and their small business customers want to grow too. What if you helped them grow internationally? Some of you may already be doing this. But, for others that aren't, you may want to think about this - already back in 2016, an OFX study found that 58% of small businesses had international customers. The key driver for this trend is technology, of course. International business is easier to access with the internet and expedited payment systems. You still may not be convinced that your business customers are ready to expand into international commerce. But, remember, our neighbor, Canada, is the top US goods export market. 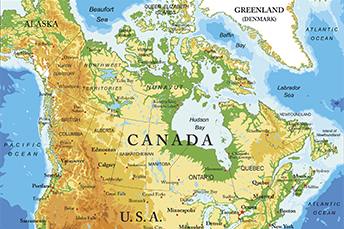 Not only that, almost two thirds of Canadian small medium-sized enterprises (SMEs) reported importing goods or services from the US, according to the Canadian Federation of Independent Business's latest survey. This could be a ripe opportunity. Ask your business customers first and foremost if they already have customers in Canada. If so, are they all in one specific market? If that is the case, it could be easier to extend their current business there than enter a new market. This can be an overlooked option sometimes. Before any of your customers do business in a particular Canadian market, they should talk to the locals, as part of their research. Are there unfulfilled needs? Are there specific ordinances or rules that could make business there challenging? If they can provide you with a meaningful and complete report of the market, they have done their research. If not, you may want to guide them accordingly before they take the plunge. Once your business customer has chosen a market in Canada, advise them to look at the economic indicators for growth in their specific industry. Both short term and long term projections should be reviewed. It is better for your bank, of course, if your business customer makes this leap a successful one. So, providing some additional guidance could go a long way for both of you. Once you have firmed up the above, and your business customer is ready to go, you will want to be able to assist them with the necessary tools to succeed. This could include wire transfers, exchange services, and now Canadian check imaging. It is more streamlined than ever to support your business customers with digital Canadian check processing. Your bank receives provisional credit within 24 hours, along with more operational efficiency and faster fraud notification. Whether your business customers go global with Canada tomorrow or not, you are now well equipped with some ways to assist, if and when they do. If you need any additional services to supply your customers for their international growth, we are here to help. Contact us today. A survey by S&P Global Market Intelligence finds mobile payment users do not seem to be against the idea of using crypto payment apps. Only 28% of users said they would not use crypto payments in the future, while 35% said that they were not sure whether they would use these services. Fed Governor Brainard indicates there is "no compelling demonstrated need" for the Fed to issue its own digital currency. She also warned that digital currencies pose serious issues due to volatility, a lack of consumer protection and potential money laundering. She also indicated widespread adoption of digital currencies could reduce deposits held at banks. According to Nomura, Square Cash, the mobile app by Square, has seen an average of 128% growth YOY vs. 74% for PayPal's Venmo. At 28mm downloads, Square Cash is only 1mm below Venmo. Square Cash allows bitcoin transactions, which reportedly has helped boost its growth as well. By the end of 2018, it is expected that American consumers will owe $4T in nonmortgage debt, more than 26% of their annual income, according to Lending Tree which examined data from the Fed. This number has risen from 22% in 2010. The good news is that credit card delinquency rates are low at 2.4%.